Every now and then, I get the urge to write and be creative with words, and that time has come for this year. I am never quite sure what to write, as it’s rare that I write creatively (as in fiction), but there comes a time each year when the sap rises and I start to think about this more seriously than at other times. As part of this project, I started to read “Bird by Bird” by Anne Lamott, and then I dug up some old writing from when I was about twelve years old in England and composing my pre-teenagery thoughts in my diary. Lots of minutiae from a pre-teen perspective, but still fun to look at. 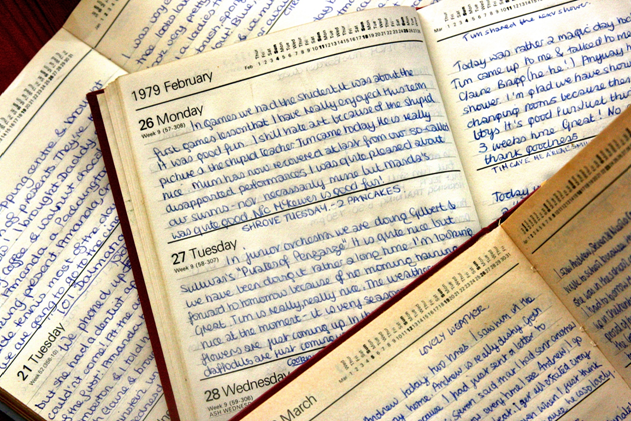 I am impressed at my young self for keeping this diary up as I wrote almost every day from about 1976 (when I was 12) until I moved to the US when I was 20. I don’t have the later editions, but I do have the earlier versions (which are probably more funny and less serious). What sort of diary should I like mine to be? Something loose knit and yet not slovenly, so elastic that it will embrace anything, solemn, slight or beautiful that comes into my mind. I should like it to resemble some deep old desk, or capacious hold-all, in which one flings a mass of odds and ends without looking them through. A “capacious hold-all” – what a fabulous description of such a document! And I can see overlaps between a diary and what’s called a commonplace book (a la Victorians), except that I think diaries have more personal reflection and thoughts in as opposed to those of other people. I still keep a journal, although it’s a bit sporadic and digital nowadays. I don’t also tend to keep the documents for a while afterwards, as most of the time, it’s usually me trying to sort out something in my head and so I think it would be either mortifying for someone else to read it and/or boring. But I really enjoy the act of writing out my thoughts, much more clarifying than trying to have an actual conversation with a real human in present time. I am much more comfortable writing words than saying them out loud, and perhaps it’s because I have always been an avid reader since I was a child. Despite the fact that I don’t let others see my journal entries, I do enjoy reading others, ranging from Adrian Mole to anthologies such as The Assassin’s Cloak or A Year in the English Countryside . So – what about you? Are you a regular diary or journal keeper? This entry was posted in Uncategorized and tagged Books in general, diary, epistolary, journal, writing by lizipaulk. Bookmark the permalink. I remember your diaries. your mother.